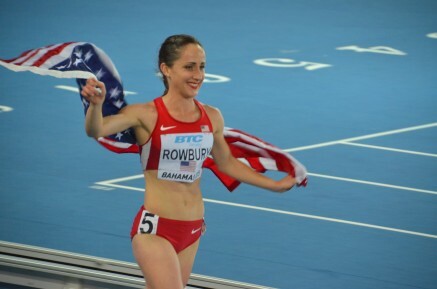 13th March 2016 – Going into a championship as the favourite is not always an easy situation to handle but Shannon Rowbury (USA) and Matthew Centrowitz (USA) both fully justified their billing at the US Indoor Championships and World Indoor Championship trials. Shannon was a convincing winner in the womens 3000m. Tracking the leaders for the majority of the race, she made the decisive move with 400m remaining and the result was then never in doubt. Showing the speed, strength and composure that has ensured she still remains undefeated in 2016 Shannon took the title in 8:55.65. After a slow opening in the mens 1500m final Matthew made the decision to do the work himself and hit the front with just under 800m remaining. Increasing the speed with each passing lap Matthew whittled the field down, and even though challenged when entering the final straight showed he still had enough left to defend his title and like Shannon remain undefeated in 2016. His winning time of 3:44.33 was run with a last 800m close to 1:50. There will also be two more PACE athletes on the US team when the World Championships take place at the same venue in Portland. World 100m bronze medalist Trayvon Bromell (USA) showed again that he has the championship mentality. Despite being out in the lane 8 for the final of mens 60m after a fourth place finish in his semi-final, he delivered when it mattered most running a new personal best of 6.51 seconds and taking the second automatic qualifying spot. Indeed he very nearly took the title only missing out by 1000ths of a second to Marvin Bracy. Laura Roesler (USA) was rewarded for a brilliant indoor season to make her first senior international team. Displaying the tactical know how and finishing speed that brought her two NCAA titles Laura placed second in the 800m in a time of 2:02.44. Jenna Prandini (USA) ran a consistent series of 60m races which culminated in a seasons best of 7.18 seconds and fourth place in the final. Less than 5 weeks after earning his spot on the US Olympic Marathon team, Galen Rupp was back and made a gallant effort to qualify here in the mens 3000m. Galen finished eighth in 7:48.34. On the roads in England, there was a brilliant victory for Tom Lancashire (GBR) at the Trafford 10k. In a high quality race Tom was the only man to break 29 minutes as he crossed the line in a new PB of 28:58.